Transports in the future will most certainly make use of the Internet of Things (IoT) to realize new services and products. For instance, Mobility as a Service (MaaS), shared mobility, self-driving/autonomous vehicles, vehicle-to-vehicle communication, are already starting to reshape the transportation system. We invite you – as policymaker, researcher or technology developer – who have ideas about, experience of, or interest in how IoT technology can support and advance the development of future transport systems. Together, we will be visionaries about the future of smart transport, identifying new and interesting research opportunities. We will discuss what transport scenarios can be foreseen and what is needed to realize them. 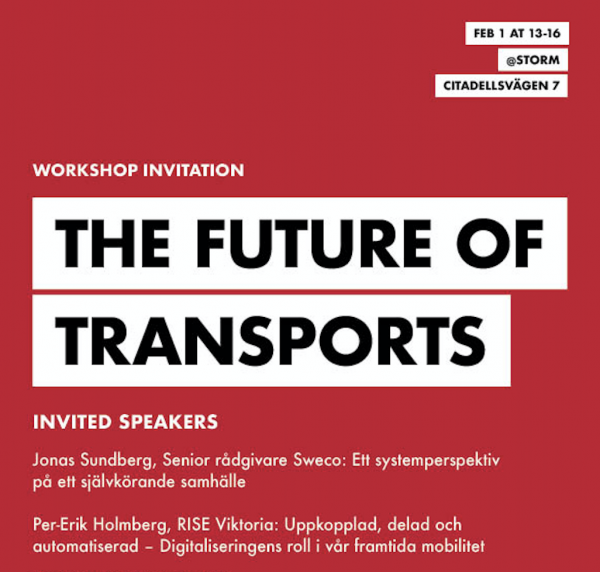 This workshop is hosted by the Smart Transport research group at the Internet of Things and People (IOTAP) research center, Malmö University. We explore the application of IoT technologies in transport systems for planning, guiding users, and support autonomous acting (e.g. autonomous self-driving cars) etc., so that the transports can be improved. In this workshop we will bring together leading researchers and experts to identify the most relevant future needs and challenges. Our goal is to identify relevant ideas of research projects that can provide tangible contributions to the future in transports. We will start the afternoon with presentations by leading experts in the area of transport research. Central questions we will explore are: What are the opportunities and challenges connected to this development? Will transports of goods and people be more integrated? Where is the major need of knowledge development? For questions, contact Jan Persson. The workshop is hosted by the Internet of Things and People research center.